Symphonie fantastique is an epic for a huge orchestra. Through its movements, it tells the story of an artist's self-destructive passion for a beautiful woman. The symphony describes his obsession and dreams, tantrums and moments of tenderness, and visions of suicide and murder, ecstasy and despair. The story is a self-portrait of its composer, Hector Berlioz. Hector Berlioz was born in 1803 in La Cote St André, a small town near the French Alps. His mother was a devout Catholic and his father a noted doctor. 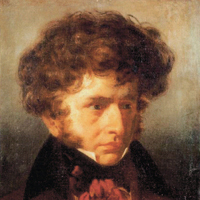 At twelve, Berlioz discovered music. He became an accomplished flautist, picked up the guitar and then taught himself to play drums. As a teen, Berlioz suffered from isolation and bouts of uncontrollable mood swings. These dramas, coupled with his fantasies of love and loss, provided Berlioz with the raw materials for his life's work. Berlioz left home for Paris to study medicine, but soon turned his attention to music. His father allowed him time to prove himself in this new endeavor but his mother considered theatrical ambitions sinful and disowned him. In 1828, Paris buzzed with two sensations, Beethoven and Shakespeare. Beethoven's music established the Romantic ideal; instead of fitting suitable music into classical forms, Beethoven reconfigured the symphony and the personnel of the orchestra to accommodate his emotional expression. Berlioz couldn't get enough of it. Shakespeare, as presented by the Irish actress, Harriet Smithson, changed Berlioz's life forever. From the moment he saw her, he was obsessed. Symphonie fantastique is nothing less than Berlioz's extravagant attempt to attract Harriet's attention. The piece begins by introducing the listener to the vulnerable side of the protagonist, the Artist. The object of the Artist's love is represented by an elusive theme called the "idée fixe" – the object of fixation. Violins and flute float flirtatiously through the charming melody. The noise of the rest of the orchestra represents the Artist's frustration and despair. Frightening outbursts alternate with moments of the greatest tenderness. It all leads to a moment of complete frenzy and collapse. Symphonie fantastique premiered in Paris in 1830. Reactions were mixed. Most disappointingly, Harriet Smithson did not attend. The second movement invites us to a ball. Two harps lead the waltz as the music alternates between watching the dancers and spying on the Artist trying to gain the attention of his beloved. After the disappointment of the premiere, Berlioz decided to compete for the prestigious Prix de Rome. For the competition, entrants were given a melody and had to write a fugue (a form with very strict rules) on the spot. It took Berlioz four years to master the devilish form but at last he won. The Prix de Rome earned Berlioz the national recognition he craved plus a subsidy to study for two years in Rome. While in Italy, Berlioz explored the musical landscape of the countryside and continued to polish Symphonie fantastique. The Third Movement of Symphonie fantastique opens with an echo from Berlioz's childhood: the sound of a cowherd's melody. Berlioz uses the huge orchestra to create the sense of suspension of time that intimacy can bring. This movement was the most difficult to compose for Berlioz. The music is always only a heartbeat away from the jealous rages that arise when the Artist sees his beloved with someone else. By 1832, Berlioz was back in Paris and determined to win public opinion with a new version of Symphonie fantastique. He arranged for a second premiere. Meanwhile, Harriet Smithson was no longer a favorite in Paris and was deeply in debt. Berlioz sent her tickets to the best seats in the house for opening night. In the fourth movement Berlioz begins to reveal the truly sinister side of his imagination. The program notes read, "The Artist, knowing beyond all doubt that his love is not returned, poisons himself with opium. The narcotic plunges him into sleep, accompanied by the most horrible visions." The first of those visions is the "March to the Scaffold." In it, the Artist is executed for the murder of his beloved. The march echoes the sound of the real life bands that would accompany the condemned to their execution. The military band escorts the prisoner to the enthusiastic cheers of the strings. In the last instant of his life the Artist thinks of his beloved. Her theme begins but is truncated by the blade of the guillotine. The Artist's head bounces down the steps, the drums roll and the crowds roar. The fifth movement is a satanic dream. The Artist sees himself in the midst of a ghastly crowd of sorcerers and monsters assembled for his funeral. The air is filled with strange groans, bursts of laughter, shouts and echoes. Suddenly, the Artist's beloved appears as a witch, her theme distorted into spiteful parody. A vast church bell begins to chime the peal of death. Bassoons and tubas bark out the Dies Irae – the traditional funeral chant. The orchestra divides into teams to enact a sinister ritual. The groaning theme from the beginning of the movement transforms into a merry black Sabbath dance. The form of the dance is the fugue – after struggling to master the form for the Prix de Rome, Berlioz chose the fugue to represent his vision of hell. The music whips into a frenzy as it bears the soul of the Artist to his damnation. His beloved gloats over the scene. Such an ending had never been heard before. At the conclusion of this second premiere, the audience erupted in applause. Harriet Smithson finally understood that Symphonie fantastique was about her. She agreed to receive Berlioz. Hector and Harriet started to act out in reality what the Symphonie fantastique only imagined. He began to woo her and then he did something desperate. From his pocket, Berlioz produced a vial containing a lethal dose of opium. Before Smithson's eyes, he swallowed it. She became hysterical and agreed to marry him. Then, conveniently, he produced the antidote from another pocket and swallowed that. After recuperating, Hector Berlioz and Harriet Smithson were married 1833. Ultimately, Smithson and Berlioz separated, but he always took care of her. They are buried together in Montmartre Cemetery. With Symphonie fantastique, Berlioz stepped into his artistic maturity. The lovesick teenager had become the Artist who had won the heart of his fixation. Buy the Keeping Score DVDs. See where and when composers interacted and were influenced by one another. Explore scores, history and musical technique and find more teaching resources at KeepingScore.org. with generous support from Nan Tucker McEvoy, The James Irvine Foundation, The Andrew W. Mellon Foundation, Marcia and John Goldman, Ray and Dagmar Dolby Family Fund, the National Endowment for the Arts, William and Gretchen Kimball Fund, Lisa and John Pritzker, Mrs. Alfred S. Wilsey, Koret Foundation Fund, Lynn and Tom Kiley, Anita and Ronald Wornick, Roselyne Chroman Swig, Margaret Liu Collins & Edward B. Collins, the Acacia Foundation, Matt Cohler, The Bernard Osher Foundation, Betty and Jack Schafer, Felipe R. Santiago and Barry T. Joseph, Mary C. Falvey, Ann and Gordon Getty Foundation, Dr. and Mrs. Jeffrey P. Hays, Mark Heising and Liz Simons, David and Janyce Hoyt, Laurence and Michèle Corash, Helen Berggruen, and others. © 2009 San Francisco Symphony. All Rights Reserved.